Iran’s security forces show signs of defecting, but will it make a difference? Over at Think Progress, Matthew Yglesias raised an interesting point about the importance of security service defection in a revolution. It’s through nonviolent resistance that you heighten the psychological contradictions, and encourage the regime and its enforcers to blink. 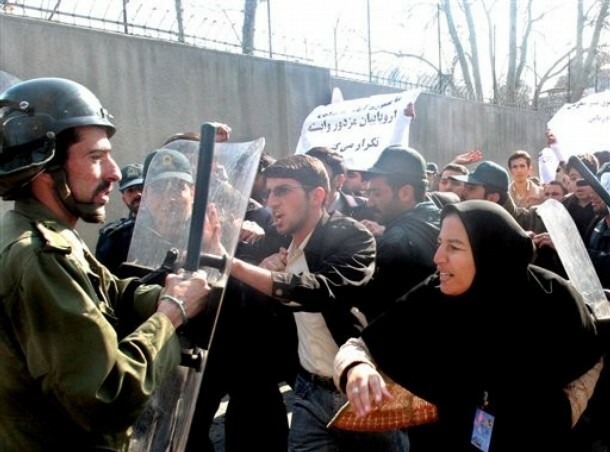 From the Velvet Revolution to Tiananmen Square to the Orange Revolution to what’s happening today in Iran, the brave dissidents are essentially daring the security forces to beat or kill them. The bet is that when push comes to shove, people in the Iranian security forces have some humane and patriotic instincts and will recoil from the idea of using mass violence against their fellow citizens. And it’s a terrifying bet. Some journalists are already reporting a turning of the tide among security forces. Matthew Rothschild, editor of The Progressive, noted it in his podcast. And British journalist Robert Fisk observed it first hand on assignment for The Independent. The armed special forces of the Islamic Republic, hitherto always allies of the Basiji, were prepared for once, it seemed, to protect all Iranians, not just Ahmadinejad’s henchmen. The precedent for this sudden neutrality is known to everyone – it was when the Shah’s army refused to fire on the millions of demonstrators demanding his overthrow in 1979. Yet this is not a revolution to overthrow the Islamic Republic. Both sets of demonstrators were shouting “Allahu Akbar” – “God is Great” – at Vanak Square last night. But if the Iranian security forces are now taking the middle ground, then Ahmadinejad is truly in trouble. Forbes’ Ramin Ahmadi gives a slightly different take on this. I have watched with horror the new footage of violence committed against the youth almost every hour. In at least one film clip, Arabic-speaking men treat a young protester like a piece of meat getting ready to be cut in the local butcher shop. The activists report seeing many of these Arabic-speaking men among the anti-riot police force in the streets of Tehran. This poses a special problem for students committed to nonviolent protest. The cornerstone of nonviolence strategy is to talk to your oppressor, to remind him of your humanity and to show him his family members in the crowd. How do you do all that when your oppressor has been imported from abroad, selected from oppressed, poor Palestinian or Lebanese communities? That question could become moot if the opposition doesn’t have a clear strategy. Stephen Zunes, writing for Yes! online, seems to think that’s the case. So far, there are little indications that the diverse opposition in Iran has the organizational and strategic wherewithal to mount a massive nonviolent action campaign that could overturn the stolen election and bring greater democracy to that country. This stolen election may hasten that day, however. Iran today is not unlike Eastern Europe in the 1970s. The people may not be ready to overthrow the system, but the ideological hegemony which had previously maintained that system and stifled freedom of thought has largely vanished. Even among Iranians dedicated to the principles of the Islamic Republic, many now see their country essentially as a police state, recognizing that Ahmadinejad and the ruling clerics are little more than corrupt self-interested politicians who have manipulated their people’s religious faith for the sake of their own power. Regardless of whether this situation becomes a full blown nonviolent revolution, it’s clear that small acts of resistance have gone a long way.